If you’re an aspiring entrepreneur, or a seasoned entrepreneur looking to launch a new product or service, CO.STARTERS is for you. The only real prerequisites are (1) having an idea you’re ready, willing, and excited to share and pursue and (2) a willingness to study, shape and fine-tune that idea in a supportive, collaborative, and welcoming environment. If you’re creative and community-minded, and you’re serious about turning your passion into a sustainable business, we want you. 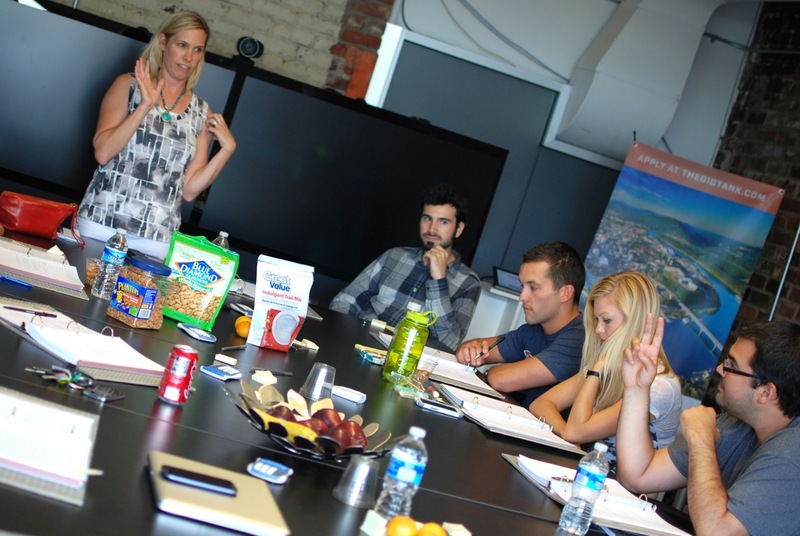 Drawing from the experience of successful entrepreneurs and startup veterans from around the globe, CO.STARTERS at Coalesce walks creative small business owners through effective business modeling methods in a simple and intuitive way, and with the help of a supportive community. Rather than treating a startup like a large corporation and writing a detailed business plan, CO.STARTERS participants are encouraged to build and test small models first. In the process, participants receive real-time customer feedback, update their models to meet customer needs and avoid creating businesses based on incorrect assumptions. During CO.STARTERS at Coalesce, you are not being lectured. This is an action-driven, collaborative process with a small and supportive group of like-minded people. Led by a facilitator who is an experienced entrepreneur, you’ll identify your assumptions about why and how your businesses will work and then talk to customers in order to validate your ideas. This approach enables you to rapidly uncover flaws in your concept and find viable models more quickly. You’ll leave the program with a deeper understanding of how to create a sustainable business, articulate your model, and repeat the process with your next great idea. Uses simple, easy to understand language and addresses the full spectrum of learning styles. Brings people together to learn from one another, creating a strong network of support for startups. Assumes customers should be the primary concern in every aspect of creating a business. Offers a tangible process for identifying, testing and adapting business assumptions to create a viable startup, and provides practical steps to launch, rather than theoretical concepts. Helps you and your business benefit from our welcoming community of creative entrepreneurs. Helps shape passions into viable and sustainable business models, whether you’re a graphic designer, an artist or the next big software success story. Facilitators, speakers, and mentors have actual experience building or advising startups. During CO.STARTERS at Coalesce, you’ll develop and fine-tune your idea, critically examining every part of it and tweaking your next steps through real-time feedback from people in the community. Over the nine weeks, we’ll cover the following topics. CO.STARTERS at Coalesce lasts nine weeks, meeting one evening a week for three hours. Facilitators include educators and active entrepreneurs, and guest speakers include specialists and professionals from Jackson’s leading marketing, branding, legal and finance firms and agencies, as well as local entrepreneurs. The total course fee for our CO.STARTERS General Session is $500, which includes course materials, office hours with the course facilitator and mentors to address your business development needs, and access to community events, networking opportunities and small business resources. All class participants will receive a three-month Community Membership to Coalesce, including the ability to attend classes and workshops, access to our coworking space, and discounts with partner businesses in Jackson. A limited number of scholarships may be available for each cohort depending on need. Dates for our next session have not been announced yet. The class will be held at Coalesce and Innovate Mississippi, 109 North State Street. Whether you’re an owner of an existing business, or you are simply exploring a start-up concept, we encourage you too apply. You will need a well-articulated description of the product or service you offer (or plan on offering) and a description of your consumer, client, or target audience. We’re looking for entrepreneurs that represent a diverse range of sectors and backgrounds, in order to establish a cohort that incorporates both established businesses and startup concepts. We screen our applicants, and space is limited. We occasionally offer a free, one-hour information session about CO.STARTERS at Coalesce. This information session is optional, and is intended for potential applicants who have questions about the program. We do not currently have an information session scheduled, but please check back for details. There is no application fee. If accepted into the program, a 50% deposit will be required immediately to reserve your seat. This deposit applies toward the course fee and is non-refundable. The balance of the registration fee will be due fourteen (14) days prior to the start of the course. CO.STARTERS applications are accepted at any time. If you are accepted into the program, you’ll be given an option to cite your preference for an upcoming session, based on availability. Space is extremely limited for each session, and spots are first-come, first-served.